Which truck is quicker in a straight line? The result probably won’t shock you. Trucks are more powerful than ever. Take the 2019 Ford F-150 Limited, for example. With the Raptor's new twin-turbocharged V6 engine underhood, the Limited can sprint to 60 miles per hour (96 kilometers) in a mere 5.1 seconds, according to Car and Driver. It's the second-most-powerful truck the company has ever tested. But how does big brother stand up against its new little sibling, the Ranger? On paper, at least, the F-150 is a much more powerful product. With a turbocharged 2.3-liter four-cylinder engine underhood, the Ranger produces a mere 270 horsepower (201 kilowatts) and 310 pound-feet (420 Newton-meters) of torque, while the F-150, with its twin-turbocharged V6, produces 375 hp (279 kW) and 470 lb-ft (637 Nm) of torque. 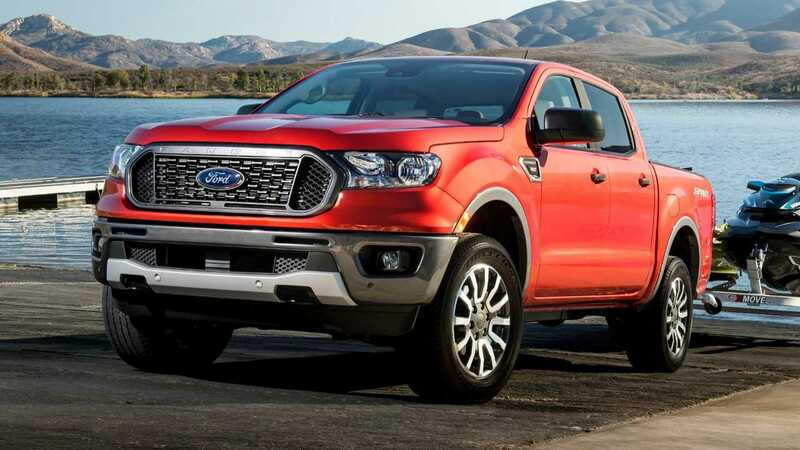 But the Ranger is lighter; the tiny truck tips the scales at around 4,400 pounds (1,995 kilograms) fully loaded, while the F-150 lumbers in at more than 5,000 pounds (2,267 kilograms), depending on the spec. With that in mind, the folks at The Fast Lane Truck pit these two pickups against each other on a drag strip. And the result is… as expected. The F-150 is the quicker of the two trucks. Its twin-turbocharged engine propels the 5,000-pound behemoth off the line with force. But that Ranger isn't that far behind; its best-in-class 310 lb-ft of torque at least keep things interesting. At the end of two races, the F-150 outguns the Ranger handily. Even with all-wheel drive, the same 10-speed transmission, and a significant weight loss, the Ranger is still more than 100 horses (74 kW) and 160 lb-ft of torque down on the F-150. In both races, the F-150 beats the Ranger by about a truck length. But don't let that discourage you, truck buyers, the Ranger still has plenty of performance. As we noted in our review, its 310 lb-ft of torque are best in class and its 10-speed transmission – borrowed from the F-150 – is superb. And with a starting price of just $24,300, it's the most affordable option of the two.